Furman MIW-POWER-PRO-PFP In-Wall Power Management DJParts - All Variety of Parts that DJ Needs. Two recessed AC receptacles deliver power to remotely located devices. 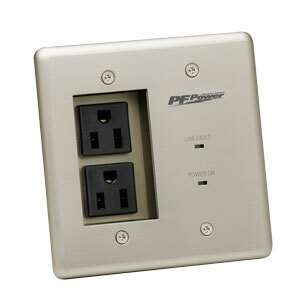 Enlarged faceplate (4.5" x 4.5") accommodates oversized wall cutouts. Line fault LED to indicate an overvoltage condition with the power to the MIW-POWER -PRO-PFP. Power ON LED indicates power is being supplied to the MIW-POWER-PRO-PFP outlets. May be used in conjunction with MIW-DUAL-SIGNAL BAY PFP and signal line modules (sold separately). 3 Year Product Warranty and Limited Lifetime Connected Equipment Protection Policy when properly installed using MIW-DUAL-SIGNAL BAY PFP and appropriate MIW Module (both sold separately). Signal Line Protection Not included (modules sold seperately). Single Pack Dimensions: 4.5" W x 2" D x 4.5" H Weight: 2 lbs.